Competitive sail racing is stimulating and fun. 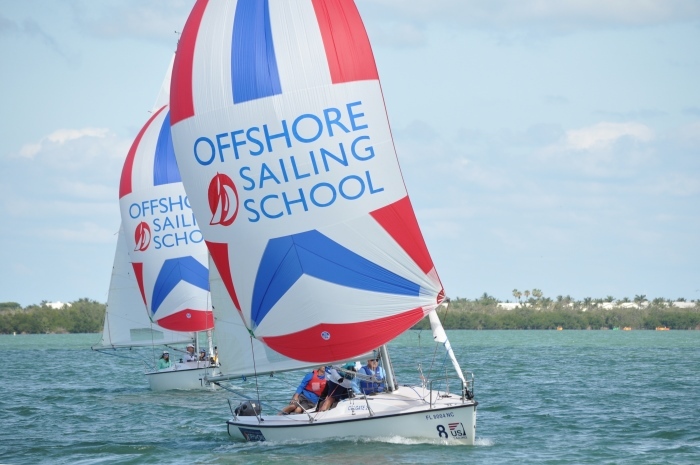 In Offshore Sailing School Performance Sailing and Sailboat Racing Courses, you hone your sailboat handling skills – with emphasis on go fast sailing techniques and sailboat safety. When you are sailing near home on a leisurely afternoon or chartering in the islands, we bet you will find yourself fine tuning your sails to beat any boat that ventures nearby after taking one of these courses. This sailboat racing class is the next step up from our Learn to Sail Certification Courses. Performance Sailing Courses cover a multitude of more advanced techniques and provide more than just go-fast sailing skills. An Offshore Sailing School Performance Sailing Course also expands and solidifies your knowledge and confidence level of safety procedures aboard, with repeated exercises to master techniques without even thinking about them. Even if your ultimate goal is cruising, you’ll find this course invaluable in re-establishing your understanding of sailing. 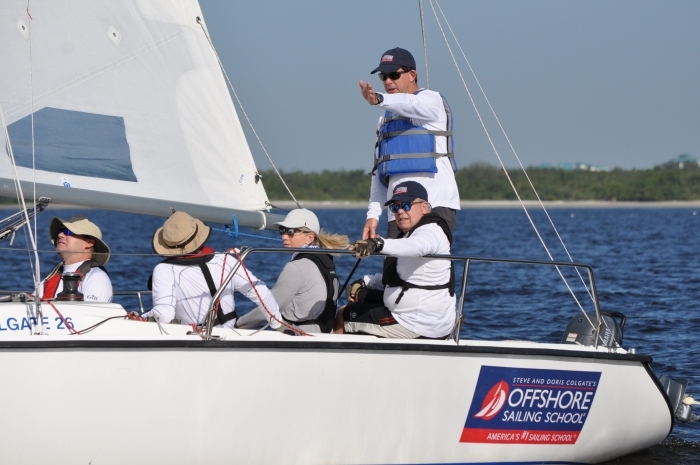 This popular 4-day program racing clinic was last held in early December 2019, with instruction on the Gulf of Mexico. 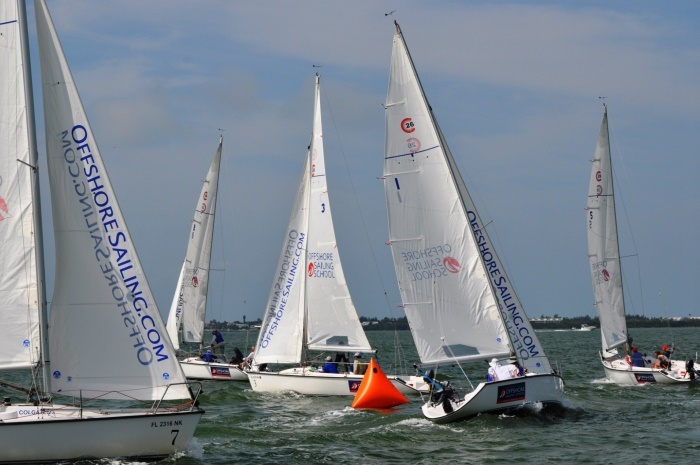 In this jam-packed four-day program participants learned to win on our fleet of Colgate 26 sailboats out of Pink Shell Beach Resort & Marina on Ft. Myers Beach. When you participate in this racing clinic you learn from some of the most dedicated racing coaches you’ll find. Spend a few extra days to relax at the resort. and take the time to visit the many attractions in the Beaches of Sanibel Island & Ft. Myers area, like Edison & Ford Winter Estates, the National Shell Museum, Ding Darling National Wildlife Refuge, or do a day-long guided tour of the Everglades. There are no plans to conduct this program in 2019 because of big events taking place in that time frame, and the advent of Performance Race Week’s 20th Anniversary in 2020. Fast Track to Sailboat Racing gives you all the skills you need to start winning in one terrific 10-day getaway. For graduates of Offshore Sailing School’s Learn to Sail Certification Course or those who sail small to mid-sized boats, this introduction to racing sailboats starts with the 3-day accelerated Performance Sailing Course, and then goes right into the 7-day Performance Race Week. It’s a blast! Since the millennium, this sail racing course has been a fantastic collaboration between Offshore Sailing School and North U – the premier racing seminar provider in the United States. Performance Race Week is held once each year, with North U director, Bill Gladstone, heading up an impressive roster of expert racing coaches. This course delivers more practice and real-time regatta starts than you’ll probably ever experience in a whole year of racing sailboats back home. You and your crew mates spend all day each day learning tactics, tweaking your sails and crew for efficient racing on all points of sail, pushing hard to get to the first mark, and the finish line, first!